I've been thinking about herbs a lot these days. I've just placed my annual order with Richters Herbs of Goodwood, Ontario. I buy lemon verbena and a few other herbs every year from them. This is a picture of my lemon verbena crop last summer. Lemon Verbena (Aloysia triphylla) is a woody shrub that overwinters in warmer climates like California but here in Ontario we have to plant seedlings each spring and harvest the leaves before frost. You can bring a plant inside for the winter but be warned, the plant will drop all of it's leaves when you bring it in and then grow new ones. Lemon Verbena has a wonderful lemony flavour that's fresh and light. Medicinally it's used for digestion, headache and fever. We use it in our Lemon Herb Tea and our Lemon Herb Pepper. The photo below is lemon basil (ocimum x citriodorum) which we also grow for the Lemon Herb Tea and Lemon Herb Pepper. We get Vicki Emlaw of Vicki's Veggies to start the seeds for us in her greenhouse. If all goes according to plan we hope to build a solar herb dryer/greenhouse this year so we may be able to start our own lemon basil as well as other seedlings this year. It's very lemony as well but with the spiciness of basil. I harvest the flowers every few days during the summer. The flowers have a wonderful intense flavour and this also encourages the plant to grow bushier. This gorgeous double rose is an old fashioned rose we ordered from Richters Herbs (their photo) called La Reine Victoria. It's described as having a sweet fragrance and continuous blooming. I also ordered the Apothecary Rose and the Maiden's Blush Rose. I planted 3 Rosa Rugosa - in the photo below with lots of pollinators- last year and thought I'd try some other varieties this time. My plan is to harvest the rose hips eventually but for now they're still not producing very many. We use rose hips in our Catarrh Tea for their high vitamin C content. 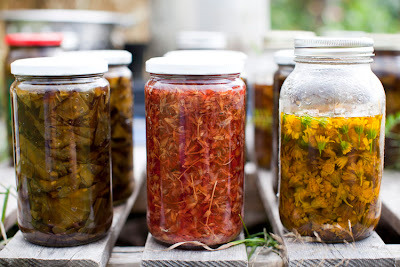 These are some herbal oils I made last summer. (Photo by Lisa Kannakko). They're made by filling a glass jar with fresh picked herbs and then covering them completely with oil - I use organic sunflower oil - and then leaving them sitting in the sun for 6-8 weeks. This extracts the medicinal properties of the herbs into the oil. From left to right they are plantain, St. John's Wort and Arnica. I planted arnica for the first time last spring. It's a perennial so I'm hoping the plants will be bigger and have more flowers this year. I also ordered another plug tray of them from Richters Herbs so that I can produce more oil. I had been asked to make the oil for a friend and she bought all that I made last year - which was only one jar. This year I plan to make a salve from the oil to use on injuries, bruises and sprains. I saw this fun idea to make an Herbarium on the Northern Ontario Plant Database website. It is, as they say, 'a collection of pressed and dried plant specimens mounted on sturdy paper'. It would be fun to do with kids. I've also discovered an emagazine called Plant Healer Magazine which I've just subscribed to. It looks full of info and beautiful artwork and photos. I'm really excited to see how the new March issue looks. They also have a cool looking magazine for kids called Herbal Roots Zine.